From﻿ my observations, people on the autistic spectrum appear to procrastinate more than the ﻿﻿average ﻿﻿neuro-typical. Those of us with autism often struggle to get started on a task, to tidy our living space, make that phone call, write that essay, tackle that pile of paperwork. We are quickly overwhelmed, confused and stressed out by all the things we need to do each day. Procrastination harms our ability to achieve things in life, because we are constantly putting off the things we need to do, in order to progress in our work and social life. This reluctance to get things done, is very common amongst the autistic adults and teenagers I work with. Somehow, we, as autistic people have to find, or be shown how to change our mindset. We need to learn strategies that enable us to be more productive, get things done and improve our lives though taking effective action. Sometimes on a cold, wet, winter’s morning, I sit in front of my computer. I have a to-do list that is half a mile long. On my list is a mixture of work to complete, deadlines to meet, bills to pay calls to make. I sit there staring at the impossible and growing list of things I need to do, and my brain switches off. Instead I become hypnotised by the delights of Google search. I check my emails, strum a few chords on my guitar, stroke the dog then make a cup of tea. After an hour or so of prize-winning levels of procrastination and avoidance of the the things I really need to do, I am completely overwhelmed by feelings of guilt, at my lack of activity, and achievement. I begin to feel lazy, useless and quite depressed at my ineffectiveness, and lack of progress. How can we achieve more as an autistic adult? I start by reseting my day, with a quick nap to clear and refresh my brain. I get the coffee on, and have a good look through my to-to list. I highlight the items that are the most important. I use different colour pens to make my list easier to follow. For example; Red for urgent, blue for less urgent, green for tasks that could be done the following day. I often take one big job on my list, and break it down into small, easy to complete bits. The emphasis should really be on making life easier for yourself, or the autistic person you’re supporting. 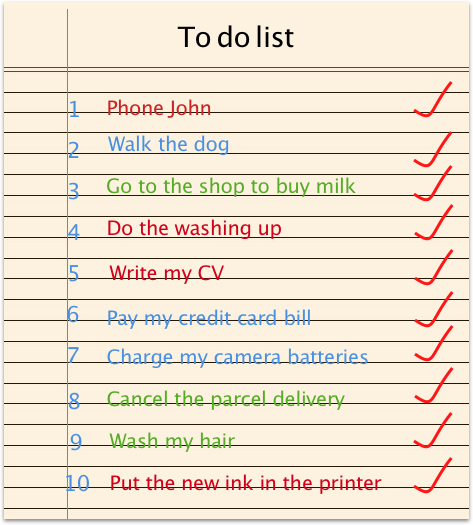 Try to feel good about each task you tick off your list. One of the most important things in this strategy, is to make sure I cross out each task I complete. This gives me a real sense of achievement, and a feeling that I am making good progress in the right direction. After a couple of hours, I look at my to-do list, and see that I have actually got a lot done. I am now feeling much more motivated and quite pleased with myself. I sometimes take another short nap at this point, or do 20 minutes meditation, and stretching exercises to reset my brain, and clear out the fog. 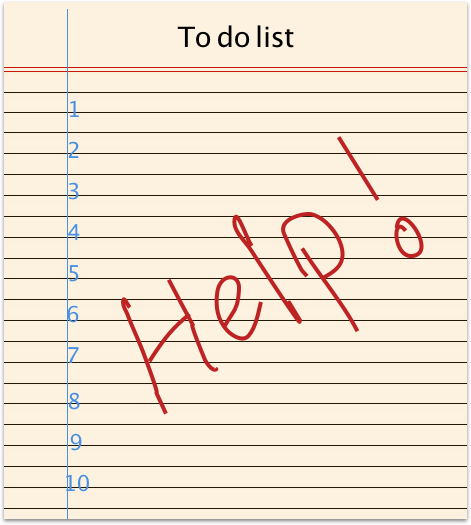 I am then ready to complete the rest of the tasks on my to-do list, and even add a few more jobs. This strategy is not necessarily anything new or revolutionary, it’s just that sometimes those of us on the autistic spectrum need to be reminded, that if we can work to a structured plan, we are capable of achieving some really great things in our lives. Some of us are able to create our own method of overcoming procrastination. There are however, many people on the spectrum that will need support to devise a good strategy to help get things done. For these people, I would urge parents, carers, friends and autism professionals, to help people on the autistic spectrum achieve more, by helping them to improve their planning skills. Together we can beat the curse of autistic procrastination! This entire article hits very close to home, but this is a particularly great reminder. I just watched some of your videos and visited your site as I highly suspect I’m somewhere on the spectrum, though no formal diagnosis. I struggle most at work, even though I really enjoy my job and my coworkers are pleasant. It’s very difficult to remain on track in a chaotic environment, and it helps a lot to have structure in my workflow. To use a metaphor, if I build the track and stay on it, the train gets to its destination right on time. Do you have any other advice for maintaining composure in the workplace? In particular, do you have a strategy for returning to task after your concentration is broken? I I find meditation in the morning and during my lunch hour can make a very pronounced difference, but the effect fades sooner or later depending on the quality and duration of the meditation. Thank you so much for your videos and this wonderful website. Thanks for contacting me. Do you live in the UK? There may be some social groups in your area, for people on the spectrum. You may me able to get some info from the National Autistic Society. Their number is available from there website. I think that quite a few newly diagnosed adults will struggle at first after an autism diagnosis. I found that I had to reassess my whole way of life after my diagnosis at 48. It’s also common that apart from the autism, many of us are also struggling with depression and anxiety. This part is best treated by a GP, or preferably a psychiatrist as they will have a more specialist knowledge of medication and other treatments. In my case, things have definitely improved since my diagnosis. Generally, the newly diagnosed adults I speak to, eventually find they are much happier once they have had time to take their diagnosis on board.